Combining elegant form vibrant texture, Honey Hill Pottery brings originality, vitality and beauty to any home or showcase. In a world increasingly dominated by standardization, our work celebrates uniqueness, quality and craftsmanship. Part of a 40 year tradition, each piece of pottery produced at Honey Hill Farm shows our strong commitment to our craft, and we invite you to explore our offerings in person at any of the events listed below. 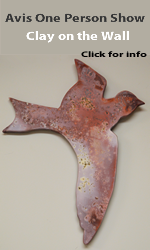 For more information please contact info at honeyhillpottery.us.